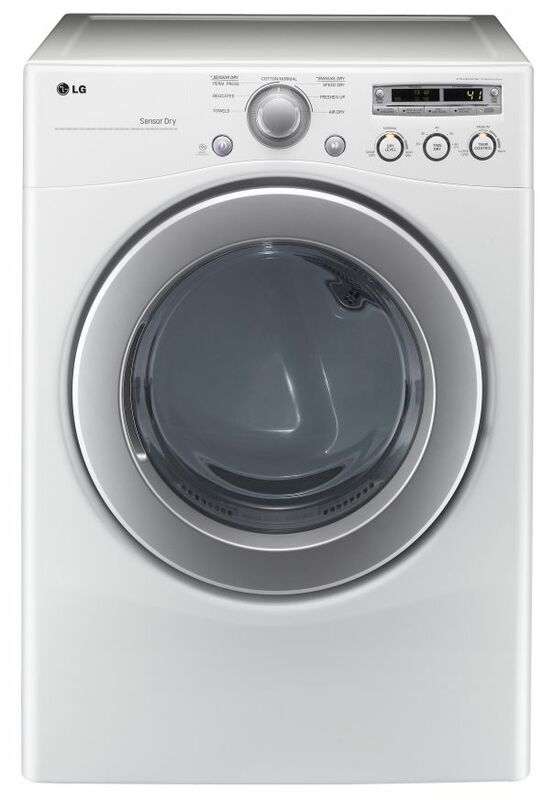 This is the summary of consumer reviews for Maytag 7 cu ft Electric Dryer (White) (Model: MEDC200XW). The BoolPool rating for this product is Excellent, with 4.50 stars, and the price range is $445-$500. 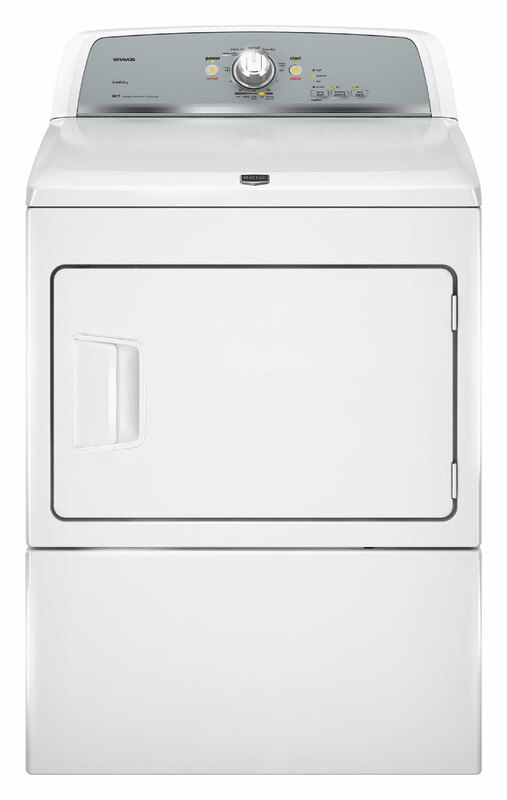 The Maytag MEDC200XW Electric Dryer is a no frills,basic, easy-to-use machine with simple settings, 13 cycles and three temperatures. This drying system does its job competently, silently and rapidly (without much ado! ), and is purse friendly too. The 7 cu.ft. drum is very family friendly, and can take in big loads easily. There is a handy buzzer that indicates the cycle's end but can be very loud if you're dryer isn't in the basement! One of the stand-out options is the Wrinkle Prevent Feature that keeps the clothes smooth even if they languish in the dryer for some time after the cycle is over. 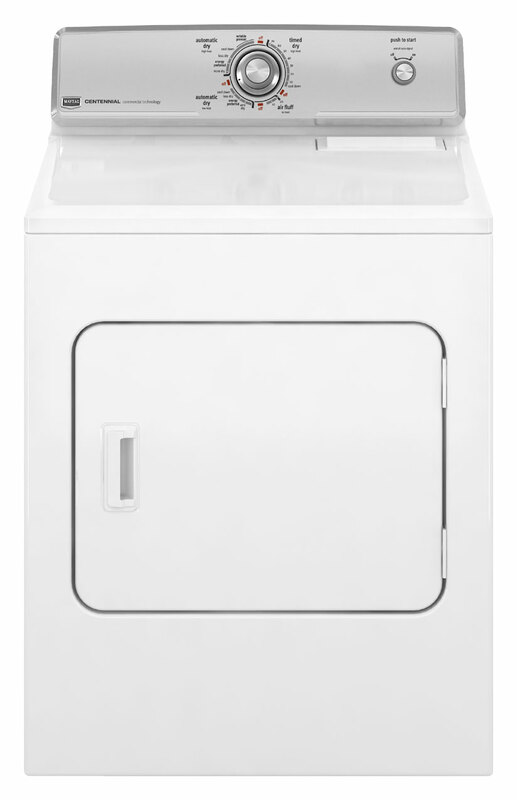 This Maytag dryer is easy to install and very easy to use with simple dials. But many reviewers question the quality and durability of the dryer, as some have encountered problems within a couple of years of purchasing it, while others find it a little on the flimsy side. If your dryer is in the darkened corner of your basement, you might want to have the torch handy, as this one doesn't come with an inner light. The dryers also lacks a dampness sensor resulting in inconsistent drying times. 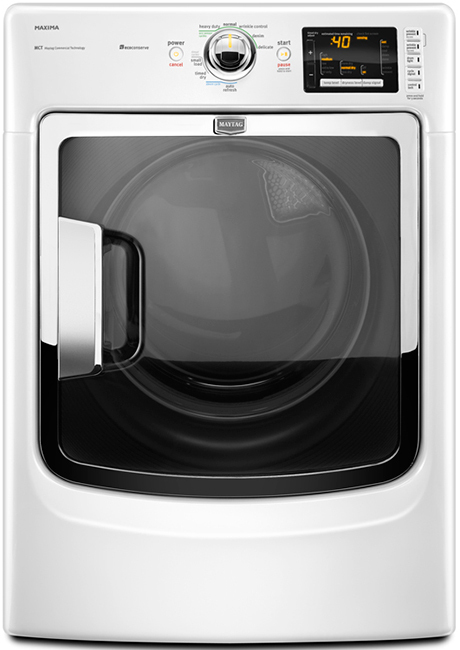 Overall, the Maytag Electric Dryer has very few bells and whistles attached to it but is a solid performer, nevertheless. With its affordable price and minimal electronics, this product can attract a serious dryer buyer, especially if they aren't that 'techy'...yet! Clothes take longer to dry. It drys my clothes quicly and quietly. Since I don't like drying clothes in "hot", I'm forced to dry with the "sensor" feature, which uses "low" temperature, and choosing "very dry" within the sensor system. Timed dry, cool down cycles as well. Our clothes haven't only been drying more quickly, but the material doesn't get all "dried out" because the sensor automatically detects when the clothes are really dry. Energy saver - wrinkle free dry. Very efficient and my clothes always come out dry. I like the buzzer telling me when clothes are dry. The Dryer takes over 2 hrs to dry a full load of clothing. no problems with dryer so far, easy to install and very quiet. the features and benefits in conjunction with the price make this a great value!. It's quiet and dries quickly. It hasn't given me any problems and I love the capacity and the quietness. 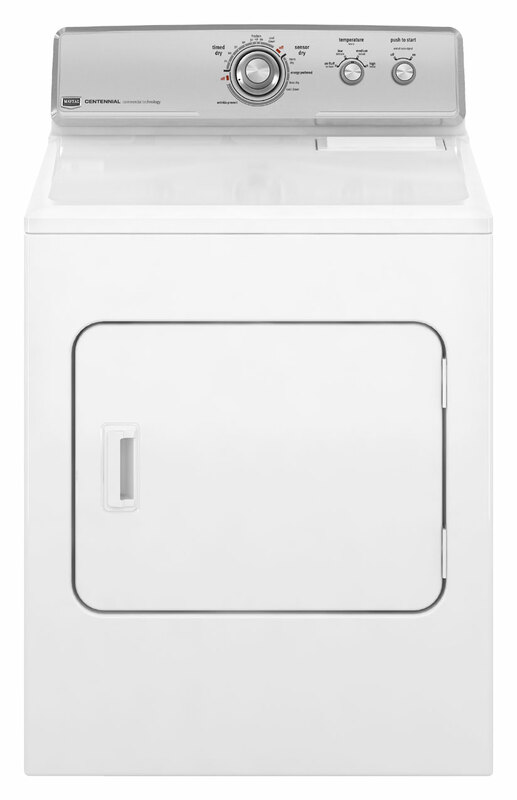 I wasn't looking to spend a lot of money, and this was a great dryer for the value, and had all the features I was looking for!. The machine is easy to use and almost noiseless in comparison to others I've had over the years. I've had a lot of Maytag products in my life all have been very good!. No door bell ring, not even at my front door. Last week my wife heard a loud bang and it quit. The energy saver feature is attractive. This's my first and last MAYTAG product. economical features make this great and economical. The buzzer is very loud and annoying but the performance is great! I went with this Maytag for the reputation as well as the price. The only thing I've to get used to is the door on the dryer opens sideways. The first one that was delivered didn't work. 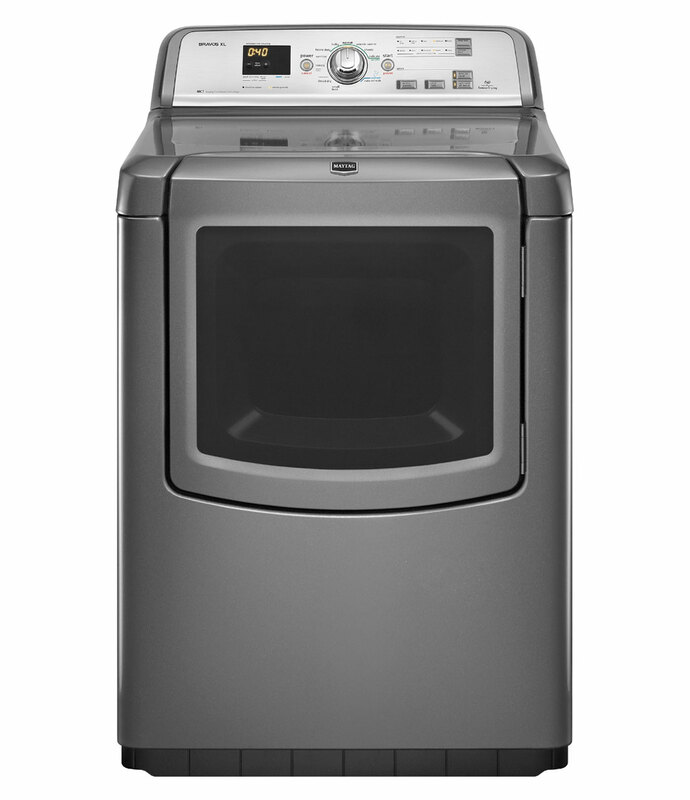 This dryer has great energy features and is very quiet. Not many extras, but special features on dryers don't seem very useful. We like the cool down feature. A week later we got another one and it works fine. Just have it delivered and tested today 1/13/12.The Home Depot delivery process and put it to work is smooth. All were dried in about 35 minutes, which is quite good, better than my earlier one.At this first test, I can say it's quite good no frill, basic dryer (yes really basic, as there's no light inside to see any thing). It seems much bigger than our previous one which usually isn't necessary for just the two of us, but it works fine. Drying time is reduced which saves drying time and money. I save time and energy due to this dryer drying in half the time my previous dryer did. Fastest drying time I've experienced! Drys in half the time of my old dryer. Needs less drying time than my previous dryer and has easy to clean lint catcher. The capacity of this product allows me to wash larger loads at a time and it drys in a reasonable amount of time. Has all of the features I need, low & high heat and timed drying. It works well on time dry seems to leave things a little damp on the auto feature. The two delivery guys did an excellent job and they were very professional. LOUD cycle-end alarm (I like it.). nice machine, great delivery and set up. For the price the drier is quiet and does a good job. The delivery and set up was very professional. Alert buzzer loudness isn't adjustable, should be!. 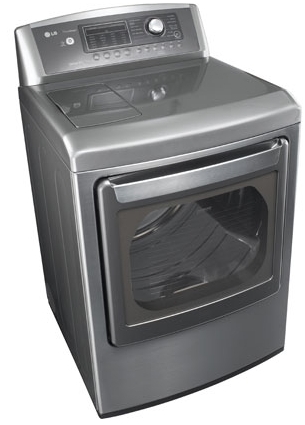 This's an excellent basic dryer...Large tub...easy dials and loud signal that you can turn on or off...so far I love it. Product was delivered in perfect condition and performs well. The best dryer you can buy at a reasonable price. I'd it delivered for an even better value. The quality is beyond my expections, I'd recommend this machine to any family. I'm very happy with this product - no ironing needed. This machine proves you don't need all the bells & whistles to get a 5 star product. It's a must have machine for a large family. This product has been far from quality since day one. We'd recommend to our friends and family to buy. Performance is very good for this product. great machine is so quiet works great and the style is good. The machine is huge, dries a full load in 20+ min, has plenty of settings, and has been one of the best buys I've made all year. The capacity is great, and it dries fairly efficiently. 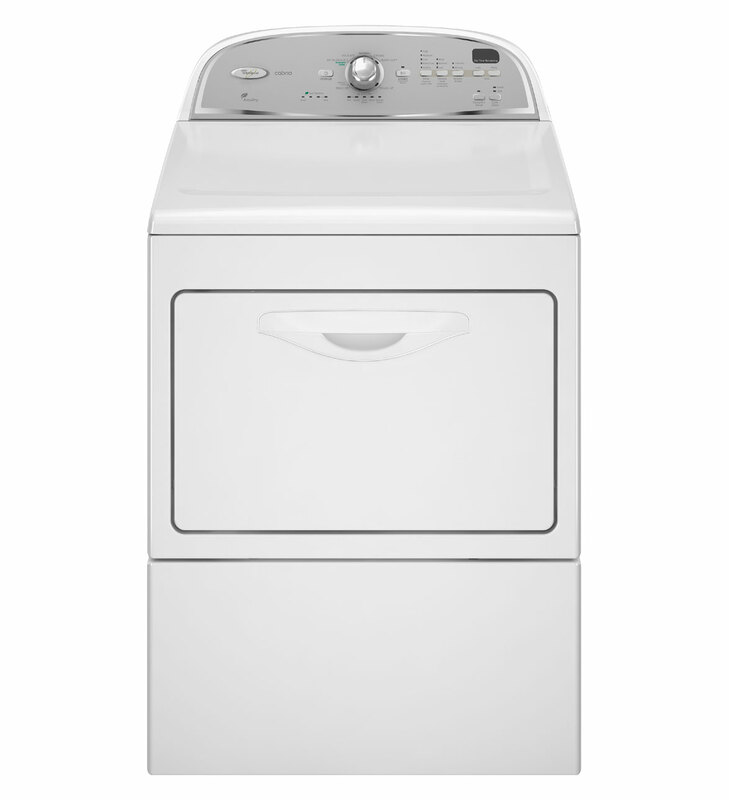 We love this efficient dryer and it's features. 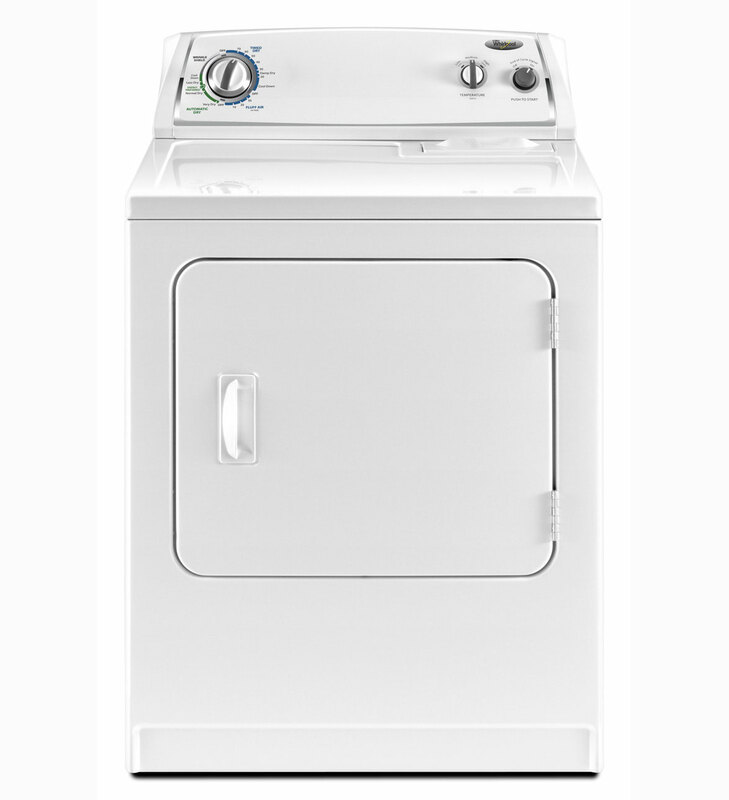 good price for features offered, hope it lasts as long as my old Maytag which is why we bought this one which has more capacity and works much more efficient. This dryer is very efficient and very quite. Very good dryer; dries well, efficient, decent build quality for a new appliance, quite, and so far zero reliability issues. I love my new dryer it's fast, efficient and economical.